140 gram vinyl; Comes in Stoughton tip-on sleeve. 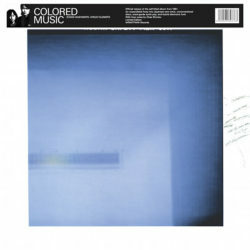 WRWTFWW Records announce the reissue of the 1981 self-titled album from cult Japanese duo Colored Music. Includes liner notes in English and Japanese by digger, curator, connoisseur, writer, and legend Chee Shimizu. An incredible mix of cosmic new wave, unconventional disco, avant-garde synth pop, and hybrid electronic funk, Colored Music is enchantingly unique, a sort of experimental and magnetizing take on David Bowie’s Berlin Trilogy with a psychedelic Haruomi Hosono touch. From the groovy post-punk glam title track to the proto-house dance floor killer “Heartbeat”, Ichiko Hashimoto and Atsuo Fujimoto hit all the right (and sometimes not-exactly-right-but-truly-genius) notes to create the odd and beautiful, an unparalleled audio escape to the best elsewhere you can think of. Also playing on the album are celebrated musicians Mansaku Kimura, Shuichi “Ponta” Murakami — 1978’s Pacific (V 25AH426), 1981’s KI-Motion by MKWAJU ensemble (WRWTFWW 026CD/LP), collaborations with Jun Fukamachi, Yasuaki Shimizu, Haruomi Hosono… — Kiyohiko Semba, Tamio “Doyo” Kawabata, and Tatsuhiko Hizawa.